In my grand defense I have just finished a wonderful and seemingly long Spring Break. I had a little over 10 days off and had originally scheduled those days as the "painting, cleaning, packing, moving around" days. Well, it seemed that mortgage companies don't go by any other schedule but their own and am still waiting for the final word. (homebuyers out there – ya feeling me on this craziness?) So I went to Plan B and did the next best thing – I knitted. I have been loving all the long coated cardigans I've seen lately and decided to design one for myself. I have been feeling the desire to design a sweater for a while now but have been a little too busy to really get it going. Hats and scarves seemed so much easier to try and create – sweaters just intimidated me. I did this one in a super easy peasy – no shaping – way and I am so thrilled with the result. Being that it was a summer sweater I naturally went for the summery yarn. Cottons and I have a weird love/like relationship. I love the end result but sometimes I just don't like knitting with it. It doesn't have any of the spring a wool does. You can't "flow" with it and knitting takes that extra little oomph… well, I hadn't met Blue Sky Skinny Cotton yet. I think that's pretty much all I want to knit with all summer long. Skinny Cotton cardigans, pullovers, throw pillows… you name it. Not to mention the array of colors are beautiful! And THAT’S the first sweater you designed?? Amazing…really! Yes!! Looks amazing…almost enough to get me back on the needles. 😉 Design more please!! Dude! This is amazing! I love everything about it! xo-S.
IT’S GORGEOUS! I love it, and i want the pattern! 4 more weeks of classes and im hoping to be back at PY Tuesday Knit Nights. Really stunning! I love the shape and the pattern. I can see you getting so much wear out of this. Great fit! I love it! I feel exactly the same about cotton. Cotton is the reason I didn’t stick with knitting as a teen. I love Que Sera too! I am definitely going to be knitting that very soon! Your sweater is awesome!!! Great color, and I’m not one bit surprised that it took you like 2 hours to knit- you’re pro! Are you moving to Bergen County? I TOTALLY want to knit this! Get to writing that pattern. Okay? Good. 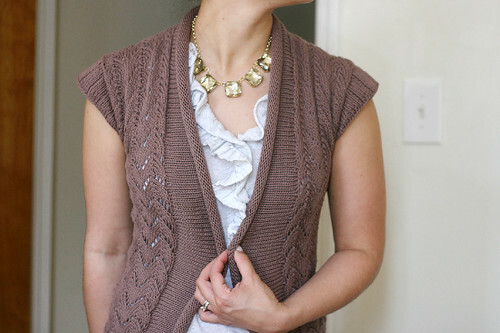 It’s beautiful and looks like the perfect summery cardigan! I love this new trend in short sleeved cardigans. I love when a thing doesn’t have any sleeves. Looks great! This is beautiful! The drape is amazing! Love it, especially the stockinette around the collar – wow! Totally, totally gorgeous!! I don’t like knitting sweaters or lace and I still really want to knit this one! This is beautiful! I love the color and it has a very nice summer look. Love everything about it – the long length, the colour, the rolling edge, the lace and the cap sleeve! that is beautiful – congratulations! are you going to write us all a pattern so we can make one too? It’s 100% lovely! Nicely done. Wow, that is one gorgeous sweater. I am inspired! This is beautiful. Really nice! Absolutely love your new sweater! Congrats on the design, I know a lot of people (including me!) would love to knit it- looks like the perfect layering piece. Wow, it is beautiful, love it ! WOW. It is just beautiful. You really have a great eye. Love it! Also, thanks for the heads up on that yarn. I am always looking for cotton that is tolerable to knit with. You don’t know my but came by your blog through sweaterbabe. Beautiful sweater! Where are you publishing it? Is this pattern written up somewhere? I’m dying to knit it! I think this is lovely! Any chance you’re still working on that pattern? I want to cast this on right now! Do you understand that it is correct time to receive the loans, which will help you. It’s beautiful, do you have the pattern available? I like it!